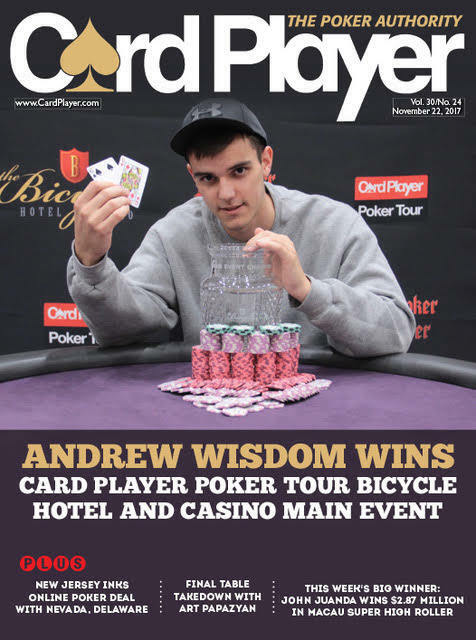 The Card Player Poker Tour rolled into the Bicycle Hotel & Casino in Los Angeles this October for a Quantum event as part of the Bike’s Big Poker Oktober series. The $1,100 buy-in tournament featured a unique format with three starting day flights that allowed players to also buy into day 2 directly for $4,300 while still receiving an average chip stack. Tournament organizers put an ambitious $400,000 on the line, but the event proved to be popular with the huge fields in L.A. as 550 entries were made, crushing the guarantee with a $673,180 prize pool. It was a massive turnout for the event, which saw a 27 percent growth from the previous year’s field of 433. After five days of poker action the field was eventually whittled down to 23-year-old Andrew Wisdom, who earned the largest payday of his career by claiming the $165,025 first-place prize. Wisdom, who is a poker enthusiast from Santa Clarita, California now living in San Diego, started the tournament with a huge hero call against poker pro Upeshka De Silva on day 1, and he finished the tournament in similar fashion against poker pro Goswin Siemsen to earn the title. Against De Silva, Wisdom check-raised the flop, bet the turn, and then checked the river on a board of K Q 9 7 6 . De Silva pounced on Widsom’s check and moved all-in, putting him to the test for his tournament life. It was Wisdom’s only bullet for the tournament, but he still managed to pull the trigger on a call with K J . De Silva could only show down 10 4 for a busted straight draw, and Wisdom was off and running with a key double up. By the end of the day, he was bagging up as the overnight chip leader going into day 2 with 359,500 from his original 30,000 starting stack. Although his second day of action was filled with ups and downs, he still managed to end up with the third biggest stack of the final 18. Once the field reached the final two tables, Wisdom used well-timed aggression to move to the top of the leaderboard. Wisdom’s momentum was nearly halted early on at the final table when he incorrectly folded pocket aces to Duey Duong on a scary board, but he managed to rebound and fight his way to heads-up play. There he took a nearly 2:1 chip lead over Siemsen before the final hand played out. Wisdom limped the button and then called a raise to see a flop of Q 8 4 . He then called a bet on the flop, as well as a bet on the A turn before Siemsen shoved the 3 on the river. After spending a while in the tank, Wisdom emerged with yet another correct hero call, this time tabling just Q 6 . Siemsen showed a king-high busted straight draw and Wisdom dragged the final pot of the tournament. “I know that [Siemsen] is a heads-up player and obviously very capable of bluffing in that spot, so when all of the straight and flush draws missed, I felt like he might try a bluff at that point. I just talked myself into going with it,” Wisdom said after the victory. Although it was a big boost to his bankroll, Wisdom said he plans on taking it easy for a little while to enjoy his big win. The win was a big validation for Wisdom, who has been playing poker since he was a child. Wisdom’s previous largest score was a fourth-place score at a CPPT preliminary event at Ocean’s 11 Casino last April for $14,525. Other notable poker pros who finished in the money included Jesse Yaginuma (70th), Jim Collopy (61st), Kevin Song (60th), Danny Nguyen (59th), Joe Serock (45th), Adam Geyer (38th), Matt McEwan (31st), Jake Balsiger (23rd), Ardavan Yazdi (21st), Jonathan Karamalikis (18th), Chris Klodnicki (17th), Men Nguyen (16th), Owen Crowe (12th), Adam Weinraub (7th) and Duey Duong (5th). The Bicycle Hotel & casino re-opened its doors to the public less than two years ago with a brand-new $50 million seven-story hotel. The 117,907 square-foot addition boasts 99 rooms, including 29 suites, as well as a multitude of amenities including the all-new Bike Brewery, full spa and elevated outdoor pool deck with private cabanas. The 29 luxury suites will range from the Classic Suite (648 sq. ft.), the signature Bike Suite (904 sq. ft.), the Governor’s Suite (1,359 sq. ft.) and a Presidential Suite (2,007 sq. ft.). The Presidential Suit has two bedrooms, a formal living room and a Jacuzzi tub. Built by R.D. Olson Construction and Lee & Sakahara Architects, and designed by Hager Design International, the hotel transforms the already massive 185-table gaming property into a space that caters to everyone. A floor design of overlapping circles, inspired by a bicycle wheel, winds its way to a variety of amenities, including dining, a coffee house, a gift shop, entry to the casino concourse and an Asia-theme VIP gaming area. The second floor has a state-of-the-art fitness center, the outdoor pool deck and the hotel spa and sauna. There is also 8,000 square-feet of multi-purpose event and private meeting space. The 28-screen Bike Brewery features 28 beers on tap, including two private labels exclusive to the Bicycle Hotel & Casino in the James Blonde Ale and the Golden Hand Hefeweizen.